The promo for the track The Stars (Are Out Tonight), features Norwegian model Iselin Steiro who is seen dressed as Bowie in the late Seventies look he adopted for his Low album sleeve. The film - directed by Floria Sigismondi, who made his Little Wonder video 17 years ago - also features screen star Tilda Swinton who plays the singer's wife. It is the second single to be taken from The Next Day, which is to be released next month and will be his first album of new material for a decade. Bowie surprised fans by suddenly announcing his comeback last month after years of withdrawing from the spotlight, with the release of a single Where Are We Now? on his 66th birthday. In the film Bowie and Swinton are seen as a comfortable, staid couple whose lives are transformed by a pair of androgynous figures, played by models Andrej Pejic and Saskia De Brauw. 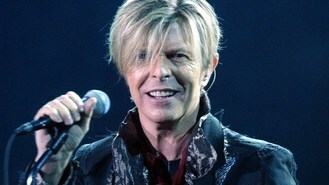 Bowie has worked with long-time collaborator Tony Visconti on the new album which is expected to be released in a fortnight.